I now have work in hand to produce effective trench sections, after some years of just thinking about it, and also to fabricate support pedestals to allow troops to man the city walls when their bases are deeper than the walkway – all clever stuff, but this will require a little while to produce something worth looking at. In the meantime, I have been tinkering with some new pottery houses (all right – ornaments, if you must) which seem to be shaping up nicely to form a 17th century town centre, and – since I had the brushes out – I have finally eliminated those ghastly red roofs from my Eco castle. I had been offered a wide range of advice – I’ve been urged to leave it alone, or completely repaint it, or do something in between, so I have produced a good British compromise – I’ve left most of the castle unaltered, and have repainted the roofs and touched in the windows to clean them up a bit. I have also painted the swimming-pool coloured moat section under the drawbridge – it is now a charming shade of mud, and I poured in my new-and-trendy Decoupage medium, which – in theory – should set to form something looking like water. This last step isn’t looking too promising at present – the medium contains a surpising quantity of bubbles. The received wisdom is that these should disappear as the medium dries, but they do not seem to be doing this – which may be related to the fact that the medium does not appear to be drying. Oh well – it may all turn out wonderful. If not, I assume that the medium will dry eventually in some form or other, and if necessary I can repaint and varnish or whatever. Let’s wait and see. I refuse to be pessimistic about it. Down in the street in 17th century Chester, or some such place? 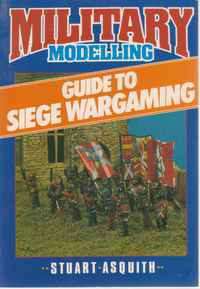 I got hold of a good secondhand copy of Stuart Asquith's Guide to Siege Wargaming, and have been looking it over. Apart from the appendix in Chris Duffy's Fire & Stone, and the Battlegames articles by Henry Hyde which use many of the same mechanisms (especially the fast/slow time switch), all the books I have ever read about having a bash at a siege on a tabletop give you a lot of good information on how real sieges work, and more or less leave you to work this into a playable game yourself. This is the hard bit - that final step is a big one - it is the space where the PowerPoint slide says "at this point a miracle happens". Asquith's book is potentially good and useful, but it is of this type - there is a lot about sieges, but a few implied leaps of faith about making an entertainment out of the matter. No problem - I am quietly confident - I am seen to be smiling enigmatically. One thing that this book certainly brings home is the dreadful loss which the demise of Gallia miniature buildings represented - there are many photos of Gallia fortress pieces and so on, in both 25mm and 15mm and they are - well, fantastic, actually. I've never seen such a thing on eBay - this book was published 1990 - I have no idea when Gallia ceased production - anyone know? An interesting post....your castle looks more business like and gothic now.I am planning to repaint my castle (similar to yours) at some stage, but I rather like the red roofs, so may repaint them a slightly different shade. My Mum has some of those houses on her windowsill, will she notice if I purloin them I wonder? I think Gallia must have ceased early 90's as I don't remember them in evidence much after that. If the moulds were stil in existance it would be worth using them again as there is a dearth of decent fortification pieces on the market. I confess I had a wobbly moment over the red roofs. I had decided long ago to make the roofs grey and threatening, but when I had the pots out I kept thinking - just a minute - these are obviously moulded as pantiles - they should be red. I believe I was still thinking this after the brown base coat went on. However, my range of red Dulux shades has diminished recently, since the Naples Red and one of the Flame Frenzy pots went solid, so, partly out of fear of producing an orange roof which was more ridiculous and toylike than the original, I stuck with my grey plan. The decoupage medium was a really stupid idea. After 24 hours it was still bubbly, and the consistency of wallpaper paste, so I cut my losses and wiped the lot out with kitchen roll and cotton-wool balls, and I am now going to paint out the moat section with khaki and two shades of brown, and apply a couple of coats of acrylic gloss varnish. If there is any unevenness I shall dry brush with baseboard green and pretend it is scum and weed. Once the flow of Tey buildings has stopped I'll post a mock-up a town section, such as would be used for a "slice" of a siege (as per Chris Duffy), with walls, gates, a town centre, creeping suburbs (to be demolished, of course) and a castle. With luck my trenches should start to appear shortly thereafter, but they will require a lot of filler and a lot of fiddling round. One thing they will not feature is decoupage medium. Bellona - now there's Old School... I revarnished a couple of Bellona gun emplacements last week - reminded me that they are weighted with Plasticene ("plazzy", as it was known in Liverpool schooldays) to stop the things sliding around when someone sneezes. ....and another thing - this same Asquith book has photos of some terrific earthworks and battery positions made by Hovels - as far as I know, these never made it into production, but they look great. You rascal - no wonder they went bust.